How can we ease Americans' financial pain and help "return the nation to a "full employment economy"? 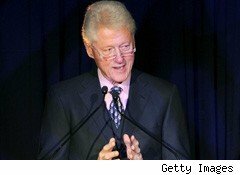 That's a question with no easy answers, notes former President Bill Clinton -- but government and business leaders can start truly addressing the economic crisis by "building a world of shared prosperity and shared responsibility," he said during a speech at the National Retail Federation's annual convention in New York Monday. In his speech, Clinton offered up some wide-ranging prescriptions for curing the nation's ailing economy, among them investing in new sectors for job growth -- for example, retrofitting buildings so that they're energy-efficient -- supporting high-end manufacturing in the U.S., lowering the tax rate for businesses so they can reinvest in job creation, and "accelerating the resolution of the mortgage crisis" by helping people who owe more on their homes than they're worth. One way would be to lower the principals on those loans to the value of the homes, he said. Clinton counted a "highly unstable" global financial crisis and America's serious economic inequality issue -- "that's what Occupy Wall Street is all about: About 90% of the economic gains over the last decade went to the top 10%" -- as being among "the biggest problems with this world." Change "begins in our minds and hearts," he said. "Work Is at the Core of Human Dignity"
The 42nd president himself started his working life in the retail business, he told a packed room at the Jacob K. Javitz Convention Center. At 13, Clinton convinced a grocery store owner to let him set up a comic book store in his shop. "I made about $100 bucks." While a career in retail never panned out for the president, as a young man, "I never doubted that I could make a living," he said. Today, the notion of financial security has been "shattered" for many Americans -- which cuts "to the core of people's sense of who they are," Clinton said. "Work is at the core of human dignity," he told the audience, paraphrasing the words of Martin Luther King Jr.
"We've got to get America back in the futures business," he said. In part, that means "reforming our education system to educate people for a lifetime." The country should also invest in high-end manufacturing to jump-start the economy, he said. Clinton pointed to Corning Glass in upstate New York -- which manufactures worldwide, but also retains production stateside, as its research labs are here -- as a sound business model. Patronizing local businesses is also important, he said, advocating for a fair tax rate for small business owners. Clinton said he relishes shopping at small stores during the holiday season. This Christmas, he bought books for his daughter Chelsea and son-in-law at Argosy, a bookshop in Manhattan, he said. But he was also "morose" about the closure of Borders bookstores, particularly the one in Chappaqua, N.Y., where he lives. Retail, one big engine of the U.S. economy, "is healthy when there's a strong middle class," he said.